One type of asthma treatment available as an inhaler form is the Flovent inhaler. It uses the steroid Fluticasone propionate and it serves the purpose of helping with decrease inflammation. Fluticasone propionate is also used in the treatment of certain skin conditions and allergies. 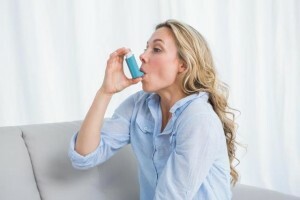 The Fluticasone inhaler is considered as a type of asthma treatment for when one is need of help other than some temporary kind of rescue inhaler. Flovent can be prescribed alone or with a combination of long acting beta agonists that work to prevent asthma symptoms. These symptoms can be things like wheezing, chest tightness, shortness of breath and a chronic cough. By decreasing the inflammation of airways, Flovent will allow for one to breath easier. It will also help to diminish the problem of hyper-responsiveness, which will help the body’s respond better to any asthma attacks. As a steroid the Flovent inhaler will act on a number of cells affected by asthma, which includes Basophils, Eosinophills, Lymphcytes, Macrophages, Mast Cells and Neutrophils. Flovent is used essentially to provide long-term help with chronic symptoms. And thus it is generally a type of asthma treatment that is to be taken on a daily basis. 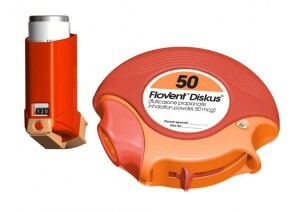 Flovent is almost always prescribed in an inhaler form. This will come in several different possible strengths. And the person will be expected use it about two times a day. However, should a patient using the Fluticasone inhaler feel their asthma has improved to the point the treatment is not needed then one should check with the doctor on decreasing the usage. That will be up to the doctor to monitor and evaluate. But he or she will be the best one to make that decision as the situation requires. And even though Flovent is normally regarded as a safe to use, there are some possible side effects. The types of symptoms that have been associated with Flovent include abdominal pain, chest pain, dizziness, hives, tiredness and weakness. Should any of those problems occur the person will need to let the doctor know. He or she may elect to have the person discontinue its use, although in many cases they symptoms will disappear during continued use. This is a form of asthma treatment that will need to be followed according to the doctor’s recommended usage. That is the most critical part to its effectiveness as a form of help. Thus it is something intended to be used on a regular basis and not only when one has an asthma attack. The person who only uses it then will decrease how it intended to help. And even if a person is feeling fine with no asthma symptoms for a while that is not the time to stop taking the Flovent without checking with one’s doctor. Flovent inhalers do come with what are called a spacer. This will increase the amount of medication that the lungs will receive. In the process the possible side effects will also increase. Therefore one will truly need to be sure on knowing how to use this treatment correctly. Should one’s asthma get worse after taking Flovent or the inhaler not long helps then one’s doctor should be contacted. And if one has any other problems then the doctor should be consulted. Also the doctor should be able to provide any help needed and answer any questions that might come up about the inhaler, its use or asthma treatments. And if needed he or she can direct one to additional sources to be sure one can be informed about all the aspects of usage for Flovent inhalers. It will all be part of the process needed to help with the proper usage of product.